My dad recently removed his microwave from the kitchen counter where it has called home for many, many years. It is now stored somewhere in the basement attracting dust. So no more microwave dinners or nuked leftovers for him! In fact, the last couple of months my dad has totally shifted his eating habits, going for mostly organic fruits, vegetables, chicken and grass-fed meat. A far cry from the frozen meals he’d zap in the microwave. Among other things, I haven’t been using the microwave for months. Could I have had an influence on him raging against the machine? I don’t need the credit, though. It’s reward enough for me that he’s ditched the microwave and changed his ways! When I began making my own dietary changes, ending the use of the microwave was something that became part of my healthy habits. I think I used it once or twice, and I would lazily heat up leftovers. However, I realized it not only promotes unhealthy eating habits, but it changes your food from what it once was. Now I never use the microwave. For reheating food, I use the stovetop and steam it or sauté it in a pan. The appliances around the home make life easier, so we’d like to think. The blender creates awesome smoothies. The food processor chops, slices and shreds anything for your meals. What’s so bad about the microwave? It’s everywhere: Offices, family homes and many restaurants will use a microwave oven to help prepare a meal. But I stand my ground. Here are three main reasons why I wouldn’t recommend zapping your food. For every claim that a microwave isn’t good for your health, there will also be others that will debunk the information. Microwaves fall into the same vein as fast food. They are meant for convenience, which promote TV dinners. Obesity and weight gain are common trends with people who use the microwave on a regular basis—I’m talking every day. Microwaving your food alters the food molecules, decreasing the nutrients. It can also slow your digestive system because the body doesn’t recognize the altered food. Slower digestion leads to fatigue and disorders such as irritable bowel syndrome. Other debated effects of microwave use include diabetes, heart health and decrease of memory and concentration. When you microwave your food within a plastic container or paper containers, carcinogenic toxins can affect your food, and increase your cancer risk. Some of these toxins include BPA (bisphenol A), polyethylene terpthalate (PET), diethylhydroxylamine (DEHA), diethylhexyl phthalate (DEHP), monoethylhexylphthalate (MEHP), benzene, xylene, or toluene. Also read: A New Wave: Should You Ditch Your Microwave? How has ditching the microwave helped my dad? He is a different person. The microwave isn’t the only change he has made to his healthy lifestyle; however, it has been a catalyst to promote healthier eating habits. Changed His Eating Habits: My dad was using the microwave mostly for defrosting meat and chicken, and heating up his packaged French onion soup. He is now interested in cooking meals with fresh vegetables and real whole foods. He also has a protein smoothie every morning, which is a far reach from the meat-lover’s pizza three times a week. He begins his day in a good mood. I’m sure the healthy eating has something to do with it. Shopping Organic: My dad has also been taking another page from some of my healthy habits by buying mostly organic foods such as produce. When he purchases red meats, chicken or eggs, they are organic and grass-fed from a health food store, market or straight from an organic farmer. He Has a Great Attitude: Call it the domino effect. The healthy eating habits affected his attitude on life. He has more energy and he is doing quite a few chores around his house. He is communicating quite well with other family members. He is able to talk through his problems in a mild tone instead of harsh and tempered. Everything is running smoothly. I attribute my dad’s transformation to all his healthy lifestyle changes, including ditching the microwave. Would you give up your microwave cooking as well? I helped convinced my dad, maybe I can convince you, too. Try it for a month and see how you feel! 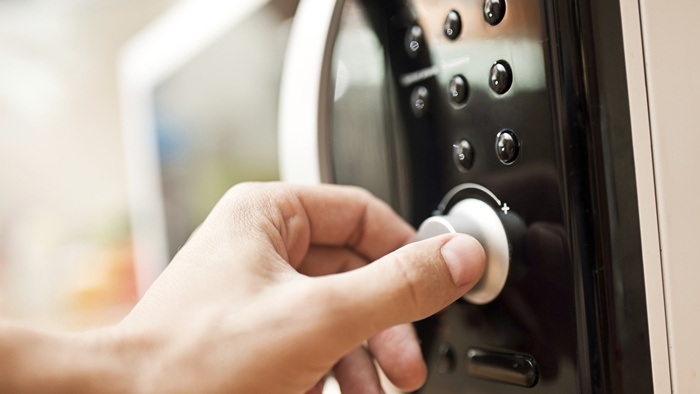 “What Is Your Microwave Doing to your Health?” Food Matters website; http://foodmatters.tv/articles-1/what-is-your-microwave-doing-to-your-health, last accessed June 19, 2014. Mercola, Dr. J., “Is This Common Kitchen Appliance Harming Your Health?” Huffington Post website, Aug. 25, 2010; http://www.huffingtonpost.com/dr-mercola/microwave-cancer_b_684662.html.